During renewal time last year, Lauren Hefner, director of membership, marketing, and communications at the Laboratory Products Association, along with her boss, realized that a longtime member of their trade association was given a discount on membership dues years ago by a former employee—and that the discounted rate was still in effect. “It was less than half of what other organizations the same size were paying,” she says. As newer employees to the two-staff organization, the pair was faced with the tough decision of whether to battle a 50-year member over $1,000. “We didn’t want to lose them as a member, but we were also afraid that another member would find out. In addition, despite years of effort, this member company had become largely uninvolved due to an aging executive staff—not attending meetings or even responding to most emails,” Hefner says. Saying “no” is not only difficult when it comes to members; imagine having to say it to your coworkers, volunteers, or even your boss. While saying no may never be easy, you can say it in ways that will make it clear that you have the best intentions in mind and will avoid negative consequences. People say no, but they do so weakly and they end up accommodating. “In other words, we turn our no into a yes,” he says. They say no in a destructive or angry way. “This is detrimental and will undermine the relationship, whether with a boss, colleague, board member, or volunteer,” Ury says. They avoid conflict and say neither yes nor no. “We leave people hanging, which doesn’t do a service to either us or them,” he says. 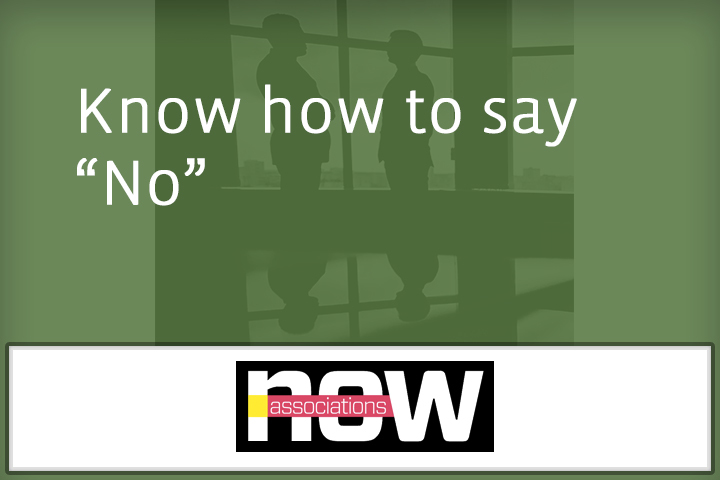 Saying no can be particularly difficult in associations. “We exist to serve our members, so when a member asks for something, you don’t want to tell them no,” says Becky Granger, CAE, director of information technology and member services at Educause. “But our job is to provide the most impactful items to our members, so we have to apply a critical lens and select what makes the most sense” for the organization. While most people would like to avoid saying no, it’s unavoidable. “Just remember for every yes you say, you are going to have to say no to something else,” says Newman. He suggests sandwiching the no: Begin with a yes, put your no in the middle, and then end with a yes. “A true positive no is a no where you’re actually saying yes to something more important. Your yes is your values and core needs and what’s best for the organization’s values and mission,” he says. After you deliver your no, Newman says, as bad as you may feel, it’s important to keep in mind that the person you said no to most likely isn’t thinking about you. “They’re really moving on to finding someone who can help them. Sure, the person may be panicked initially, but the asker moves on and is not sitting there thinking you’re a terrible person,” she says. But what should you do if the person you have to say no to is one of your association’s volunteers or your boss? What If You’re Told No? However, persuading to the point that a person feels like she has no option but to say yes is not a good approach. Instead, you may want to ask what else is on her plate and work together to see if projects and priorities can be adjusted. Ury says the common ground between saying no and receiving no is respect. “Respect is the cheapest concession you can make in any negotiation because it costs you nothing and gains you everything,” he says. While the ability to say no is important in associations, so is having an environment that accepts no and understands when someone is saying it for the right reasons. To decide which ideas to pursue, the organization has core teams that look at whom the idea would benefit and how much. “Ideas that would benefit a large number of members in a big way will be prioritized over other ideas, and some ideas just don’t make the cut,” she says. Additionally, Granger says some staff have personal preferences about how they like to use technology tools and sometimes ask for special access to the team or help on apps that her team wouldn’t usually support. Sometimes just hearing the word “no” can put a person on the defensive. Try these phrases instead to keep the conversation open. No Replies to "Know how to Say "No""